The Gay Gamer: Let me know when Game Dev Story is added to the Mac App Store, will ya? Let me know when Game Dev Story is added to the Mac App Store, will ya? Sure, I could drop $4.99 Angry Birds or the original version of Pac-Man (as opposed to Pac-Man: Championship Edition), but I'd rather save my hard-earned cash for something I really want--like Game Dev Story. 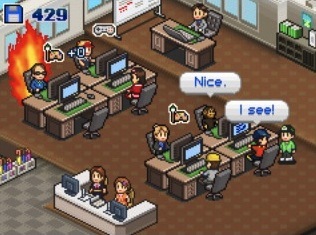 For those of you who have never heard of this Kairosoft-developed title, it lets you manage a game company as it attempts to create a million-selling game. Players get to create said company's game console, develop an array of games (including "dance RPGs" and "ogre racing" titles, according to this hilarious Wired article), hire/fire employees and more--although not necessarily in that order, of course. Anyway, it should go without saying that if Game Dev Story were available on the Mac App Store it would be sitting on my desktop already. Here's to hoping that happens sooner rather than later. I'm so hoping that Game Dev Story will be released in a bigger, more complex computer version. If they'd make it somewhat like The Movies I'd ruin my favourite pants. Oh, that sounds good to me! At this point, though, I'd take even a bare-bones port -- since I don't have access to an iPad, iPhone, iPod Touch. BTW, I believe I've read the game originated as a Japanese PC game -- which could make a Mac port easier, no? One more thing, Balloonfigher -- I just started following your blog even though I don't know a lick of Swedish :) (Sorry, I didn't realize until now that you had a blog.) Are all of the illustrations on it yours? If so, great work! Okay, perhaps it's a _bit_ too text heavy for one who doesn't know japanese. Well, you've sold me on that. I'm loving the Mac App store. It's a good thing I only have $20 to my name, currently. Keep us posted! I'll bet it's on its way. Have you downloaded anything from the App Store yet, Justin? If so, which titles? Nothing exciting yet. I downloaded some free software for idea mapping, but that's it. I'm way poor, at the moment. Sorry to hear you're poor at the moment :( Hopefully things improve soon.